Body position should be sought between each stroke. 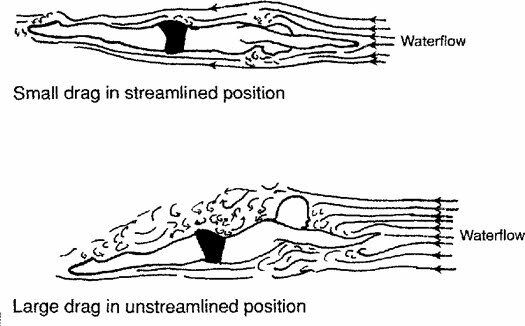 The breaststroke breath should be low to minimally disrupt streamline. The kick should occur with the arms and head in streamline. While butterfly is commonly depicted as the hardest stroke, breaststroke is typically the most difficult to master. Even many elite swimmers do not perform breaststroke properly, causing frustration and the use of dolphin kick breaststroke. This is the guide for how to swim the breaststroke, a step-by-step process of “ideal” breaststroke biomechanics. Ideal biomechanics is an individual term, making this guide simply an outline, as one-on-one coaching and an individualized biomechanical assessment are necessary for each swimmer for the greatest benefit. If you don’t have a coach, you can start checking off each of these items once mastered. If you swim for a team, run these biomechanics by your coach and make an individualized program for improvement in your stroke. For a review of terminology or if you come across any unfamiliar terms in this guide on how to swim the breaststroke, check out our basics page. Also, if you enjoy this, consider purchasing A Swimming Technique Macrocycle by Dr. Brent Rushall. Keep the head, body, and hips streamlined. This is difficult to appreciate as a swimmer, but simply the back of the head, the top of the glutes, and the heels should lie in the same line, minimizing drag. · Minimally raise the head and shoulders for minimal drag. Excessive head and shoulder movements create many ripples in the water and excess drag. Try to have the chin thrust forward, slightly above the surface of the water. · When breathing, lift the body forward, not rocking back. Any backward motion decreases forward horizontal velocity. · Keep the hips at the surface while breathing. Most elite swimmers achieve this motion through thoracic spine hyperextension, but can also be performed by pressing the chest forward and minimally raising the head (see above). · Explosively exhale immediately after the late catch position. A quick exhalation helps keep the chest low and streamlined, as air in the lungs likely raises the chest secondary to the floating lungs. · Quickly inhale at the beginning of the recovery stage, then return the head to the water. · The breathing action and return to streamline should be completed before the draw-up of the legs preparatory to kicking is completed. · Transitioning from the body position, open the hands quickly to shoulder width or wide. This position will maximize the amount of water grabbed during the next steps of the catch phase. · Internally rotate and abduct the arms, flex the elbows and wrist in an attempt to propel water backward. · Continually flex the elbow while the arms abduct to keep the propulsion directed backward. · One the elbows reach the level of the shoulders, cease the phase and return the arms as quickly as possible to the body position phase. · The late catch should feel like the fastest phase (like in every stroke). This sensation helps move the arms through the propulsive, but also the position of most drag. · The elbows should not pull past the line of the shoulders, as this creates excessive drag. · Attempt to have the total arms (upper arms, forearms, hands) facing directly backward. · As much of the swimmer as possible should be kept underwater for minimizing drag. · As the late catch transitions into the recovery, the hands should thrust forward and in, bringing the arms as fast as possible to the proper body position. · Move the arms as quickly as possible to the body position. Move your arms in a direct line, strictly parallel to the water, don’t attempt to raise the arms above water. 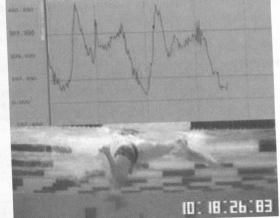 Recovering the arms above water creates excess wave drag, likely slowing the swimmer. · Return the head and shoulders to streamline before the arms are maximally stretched forward. · Quickly pull the heels up, with the knees approximately shoulder width apart with the thighs angled, and the lower legs (shins) vertical. · Attempt to grab water with the inside of the feet, ankles, and lower legs. · The duration of the kick should be with the arms, head, and body in the correct body position (see above). · Kick the legs rapidly, much faster than the arm duration. · The end of the kick cycle should have the legs closed in streamline, as the catch phase initiates. Breaststroke is likely the most technical stroke in swimming making it important to learn how to swim the breaststroke. Luckily, a technical stroke is possible to make greater improvements. Rushall, BS. A swimming technique macrocycle. 2013: Spring Valley, CA; Sports Science Associates [Electronic book]. Don’t attempt to raise arms above water in recovery….. fair enough. Then why show a swimmer doing just that in headline photo? Good point 🙂 It is a what not to do photo.